I believe grief is often marked by a loss of focus (not to mention loss of physical objects). I am coming to believe that successfully navigating life with grief (as nearly all of us must do) involves regaining focus–on other people’s thoughts and demeanor, on work and recreation, and on what one may not have even noticed is fleetingly around us. I took this photograph without actually looking at exactly what was being captured: while moving at a decent clip, I held the camera in my right hand, pointed it in a general direction, and pressed the button. 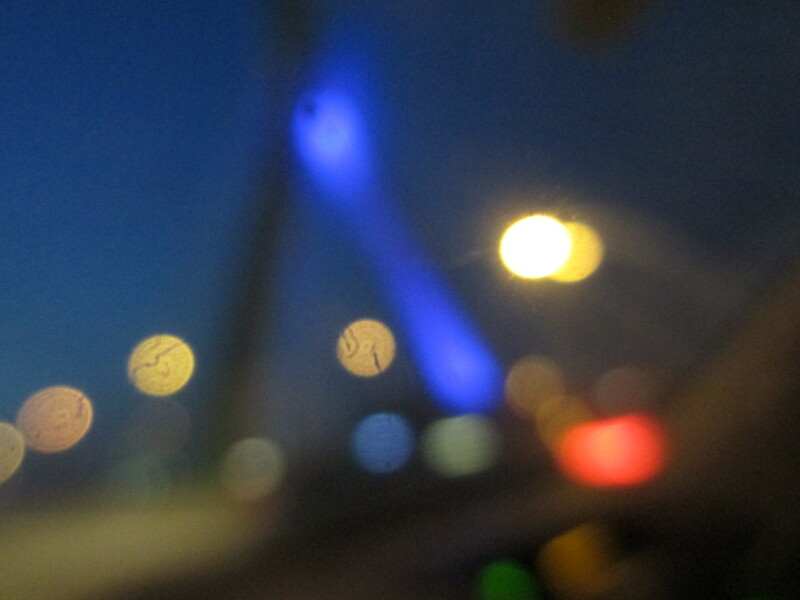 What I actually saw was beautiful to me, and I wondered what an unfocused glimpse of it might look like. For far more competent and serious photographers (and for those who enjoy viewing the work of such talented people) I want to share another series on the concept of focus. Jim took these. I’m including them because of course he can’t; he left his body of photography to me. I wanted to share the type of “aha!” moment I get when I review his exceedingly deliberate changes of lens and aperture. Is it a bird? A flying squirrel? It begins to become clear…. This entry was posted in Love and Loss and tagged aperture, focus, grief, Jim, photography, postaday, Weekly Photo Challenge: Focus. Bookmark the permalink. It appears that this is a monkey or mankey? I love the cheeky title! Do tell, I see the monkey in Jim’s photos, but other than a guess of “something at night,” I haven’t a clue as to what your photo is? I’m giving my little brother until midnight (after Breaking Bad) to identify this. Otherwise I’ll tell. We have a winner, and under the wire. Zakim Bridge with a nearly full moon behind it. You win a trip to the Friendly Toast! Mmmm, friendly toast. We’ll have to go there before the BB finale in a few weeks.